It could seem that most of the work is done, but the phase of aging is very delicate for a wine and requires great attention and experience. After the twelve days of carbonic maceration, just after having separated the grape marks and seeds from the wine, I can’t wait any longer! My curiosity and impatience are too great and I can’t resist filling a half glass with the new wine. The rich colour and intense bouquet are the right ones at a first glance. It seems that also this year we’ve made it! The perfect concentration of antocyans in the grape marcs has indeed given the wine the ideal colour and the typical secondary aromas. 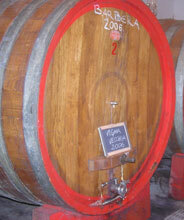 In the aging area, cask n° 2 is ready to receive the wine thus starting the complex and rigorous process of aging. The goal is to fully develop the wine’s potential and to preserve it in the best possible conditions in order to guarantee an excellent product and its perfect biological stability. The choice of the cask, the temperature and humidity of the aging room are among the key factors in the delicate aging process that lasts until the bottling. Wine is a “living creature” that evolves constantly and because of that during the aging process several operations have to take place in order to keep the precious wine in good health. In the first racking of the wine from the steel tank (where fermentation has occurred) to the oak cask the wine undergoes a first process of separation from the solid parts resulting from fermentation (yeasts, suspended particles, residues from the seeds and marks). The racking will be repeated at least twice more during the first year of aging in order to continue this process thus freeing the wine from solid residues that due to gravity precipitate to the bottom of the cask. The second racking took place last December (a cold temperature helps the precipitation of the solid parts in suspension) a third is scheduled for the summer and a forth one will eventually take place late in autumn. 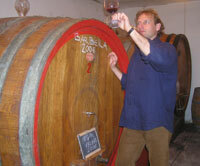 During aging, the role of oxygen (in small amounts) is essential, although an excess of such gas inside the cask would have devastating effects on the wine (leading to premature oxidation). It is therefore extremely important to constantly check the wine level (which actually varies during the year due to changes in temperature and other factors such as absorption by wood and transpiration) and eventually topping up with whatever wine is needed. 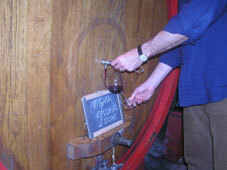 Apart from these two important operations aimed at transforming a good wine into a great wine, the history of “Vigna Vecchia 2006” will be from now on made of very simple ingredients: silence, darkness, the right temperature and humidity of the room in which the wine will rest inside the barrel crafted by the expert hands of the Garbellotto family, barrel makers since 1775.